Natsuko Yoshimoto (violin)studied violin at the Yehudi Menuhin School from the age of 11 and was taught by Lord Menuhin and Wen Zhou Li. She received scholarships at the Curtis Institute of Music in Philadelphia and the Royal Northern College of Music in Manchester. Natsuko won the Gold Medal in the 1994 Shell / London Symphony Orchestra competition and performed at Buckingham Palace in the presence of the Queen. 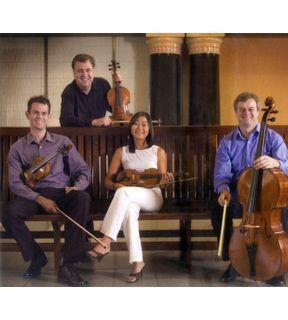 She has been first violinist with the Australian String Quartet since 2001. Natsuko is in demand as both a chamber musician and soloist. She has appeared at major international festivals and with orchestras including the Philharmonia (UK), London and Tokyo Symphony Orchestras and most recently with Orchestra Ensemble Kanazawa under Iwaki Hiroyuki. James Cuddeford (violin) was born in Brisbane and attended the Yehudi Menuhin School in England in his early teens, later studying at the Royal Northern College of Music in Manchester. His principal teachers were Lord Menuhin, Wen Zhou Li and Gyorgy Kurtág. James has won numerous awards for both performance and composition including First Prize in the Charles Hennen International Chamber Music Competition in Holland. James has performed regularly throughout Europe and Asia as a chamber musician and soloist including performances with the Camerata Lysy Switzerland, the London Vivaldi Concertante, the BBC Scottish National Orchestra and the Queensland, Adelaide and Tasmanian Symphony Orchestras and the Australian String Quartet. Jeremy Williams (viola) graduated from the Guildhall School of Music and Drama with distinction, where he studied with David Takeno. On graduation he was immediately accepted by the London Symphony Orchestra as the youngest violinist, and performed under conductors such as Abbado, Svetlanov, Previn and Celibidache. In addition he played regularly with the Academy of St Martin in the Fields and London Sinfonietta. In 1983, Jeremy was invited to become a member of the Delmé Quartet. He later joined the Nash Ensemble, the York Piano Trio, and formed the Beethoven String Trio of London in 1990. Concert tours include Japan, Russia, the USA, Europe, Asia and South America. From 1998-2002 he was Principal Viola of the Hong Kong Philharmonic, and came to Australia in 2003 to play with the Australian String Quartet. Born in Aberdeen, Scotland, Niall Brown (cello) started studying the cello aged six. Early on his talent was recognised by Yehudi Menuhin, offering him a place at his school in England where his professors were the distinguished cellists, Maurice Gendron and William Pleeth. He completed his studies with Radu Aldulescu in Switzerland and Holland, and went on to be a prize winner in competitions for cello and chamber music in Great Britain and Holland. Niall has performed as soloist with the Camerata Bern, Camerata Lysy Gstaad, Lausanne Chamber Orchestra and the Scottish Ensemble, and partnered such artists as Yehudi Menuhin, Gary Karr, Alberto Lysy and Janos Starker to name a few.Niall’s passion for chamber music has led to his forming a long partnership with pianist Isabelle Trub and the Australian String Quartet. a fruitful re-engagement with tonality... three meticulously crafted works... Performances are superb throughout.